My apple butter experiment with fructose did not work well, but I am sure with sugar it will be perfect. In today’s tough economic times, jobs are precious. In the last couple of months 3 large hardware supply companies in our area have closed their doors leaving countless people unemployed. You would expect people to look after the company’s that employ them. I know I am, even though there was no bonus for me last year. Dave told his staff they would get their bonus the day they got back to work. Their bonuses were based on the amount of time they had worked for him, less the number of days taken off not due to illness. His one fitter & turner worked the entire 12 months of last year, taking off 17 days for reasons other than being sick. Add on to that his 15 days leave and it means that he was not at work for 2 months last year. He did not arrive on the first day back, and sauntered in on the second day, late. That was the last we have seen of him. He has gone back to study – something Dave would have paid for had he chosen to stay and work. Not only has he lost his income, he has lost any chance of a reference. Very short sighted if you ask me. Another failure in my opinion was my attempt at making this recipe in a sugar free version. I am sharing the recipe however, as I am sure one of you will be willing to try and make this work! Did you make the label? Hey Tandy…would also like to know what you would do with the apple butter!! My husband and I have owned three restaurants, and I swear, we could write a book about all the people that worked for us and the way some of them behaved After all this time, I am still amazed how disrepectful and uncaring people are of their employer and their co workers. We try to remember only the wonderful employees we had. They are what made us successful! But in these difficult times? To leave a job like he did~People are crazy! I made Apple Butter once, a long time ago. I will have to dig out my recipe. I’m intrigued. My 18 year old son just got his first job at a local restaurant and they tell us constantly how much they love him! His attitude (fun and always laughing and smiling) and his hard work ethic really went a long way with them. He credits this to his hockey background.. I think it’s also the way he was raised (a little back-patting here) but it seems so many young (and older?) people feel life owes them something? I wish you owed me a jar of your apple butter.. sugar or no sugar, that looks amazing! Tandy, I have never made apple butter but I can give you a little input, as my apple sauce is close to apple butter. First…certain apples are better for making apple butter. Not knowing what you have available, I can say that Gravenstein is the absolute best. Any of the Jonathan varieties are good as well as McIntosh, Northern Spy and Winesap. You want late apples because they will be the sweetest. Also instead of water, use apple cider (3 cups) reduced down to half. I also think it needs to be cooked much longer. I hope that helps. You will find that the poor guy got the advice to just pack and go,but it is sad. I have never made nor eaten Apple butter, apart from spreading it on pastry’s what else could you use it for? As someone going through the jobseeking process right now I marvel that someone can be so flippant with a job Tandy. Hope his replacement appreciates what he has! 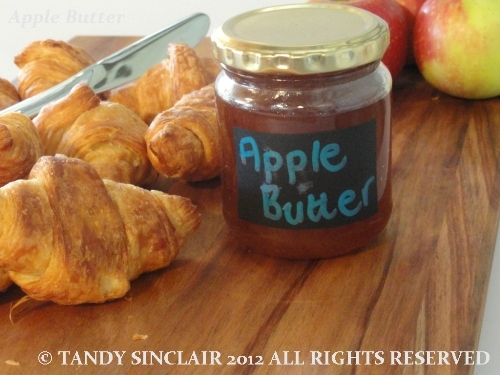 Apple butter: we’re still on hols so we may well give this a try! Thanks! I love apple butter, I would love to make this version! Cheers! Work is very scarce nowadays, and precious!! I have never made apple butter. You can guarantee he will be back with some long sob story asking for his job back! What a pity your recipe didn’t work out like you had hoped. It still looks lovely. Silly man to have blown a good job – but what a fun lead. “This too a failure” – teehee! I think making ot completely sugar free would be difficult because doesn’t the sugar help make it syrupy as well as taste good? I wonder if there’s a super sweet fruit you could reduce and add to it. Nothing comes to mind right now but I’m ready for bed! You’re so right about most people and their lack of concern for the companies that pay them. You hope that someday they’ll learn but some people never seem to. At least you can count yourself among the aware and enlightened.